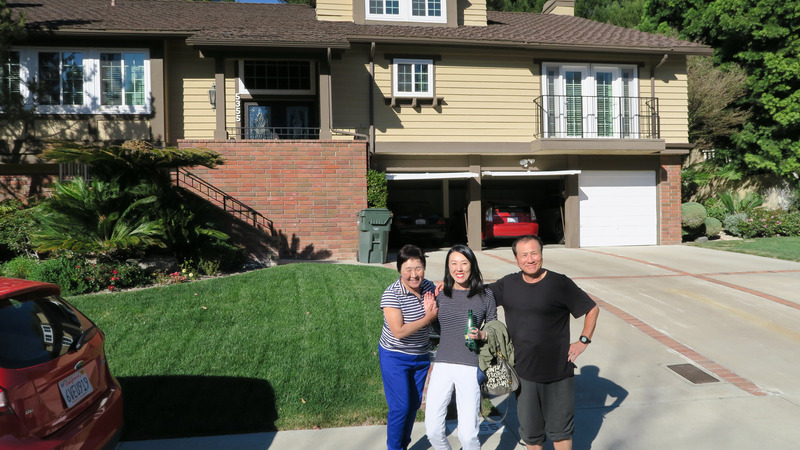 Katherine and I drove down to her parent's home in Los Angeles to watch Katherine's mother Ki (기) make kimchi from scratch, and bring some home to the San Francisco area with us. 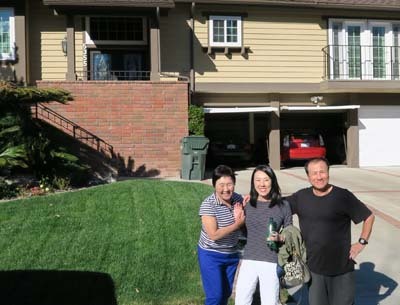 Background: Katherine and her parents Ki (기) and Yong (용) and Katherine's brother Will were all born in Korea and came to the United States in 1975. Kimchi is a quintessential banchan (side dish) in Korean cuisine. Katherine says that as she was growing up (in the USA), their family ate kimchi (as a side dish) almost every day. Kimchi can be made from different things, but Kimchi made from Napa Cabbage is called "Baechu-Kimchi" (배추김치) is one of the very most common. Napa cabbage is harvested in November, and preparing Kimchi is a way to preserve it to provide food through the winter. Traditionally, kimchi was made in clay containers called onggi (옹기) and buried in the ground during winter. The cold and the fermentation preserved the food for up to a year. Nowadays, most Korean families no longer make Kimchi themselves, most buy store bought kimchi from kimchi factories. But Ki (Katherine's mother) still makes it every year "home made" entirely from scratch. The results are amazingly delicious. I have been eating Ki's kimchi for years, but I did not understand how it was made. Since it is only made once a year (the Napa cabbage is "best" if harvested in November) so we took a trip down to Los Angeles to watch Ki make the kimchi from scratch. Dissolve 2 cups salt in water in a circular tub. Split each head of cabbage into two halves, and "notch" the ends. Remove any spoiled bits of internal cabbage. Then dip each halve in saltwater and lay in a second circular tub. Pour all saltwater over the top of the cabbage. Cover with second tub. Wait 15 minutes. Rotate the tubs so that the cabbage on the top of the tub is now on the bottom of the second tub. Wait 15 minutes. Now that the cabbage is a little more flexible, pry apart the cabbage and apply more salt to between every leaf. Wait 4 hours (so 4 - 5 hours total). Rinse off the cabbage with fresh running water by washing each piece and transferring all (now washed) pieces over to the other tub. Clean original tub, then repeat back. Do this washing three times total, and finish by laying all cabbage on top of the back of a tub to drain overnight (8 hours at least). Simmer/boil 2 cups of sweet powdered rice in 2 cups water for 40 minutes. After 20 minutes, add blended yellow soybeans. Combine all incredients and mix (do not add the cabbage or any additional salt yet). Smear sauce from "B" inbetween all leaves of cabbage "A". Make sure to ball up the quarter cabbages to try to get all extra air out of them. Stack into a gallon plastic ziplock bag, remove as much air as possible, then put in glass or tupperware container. 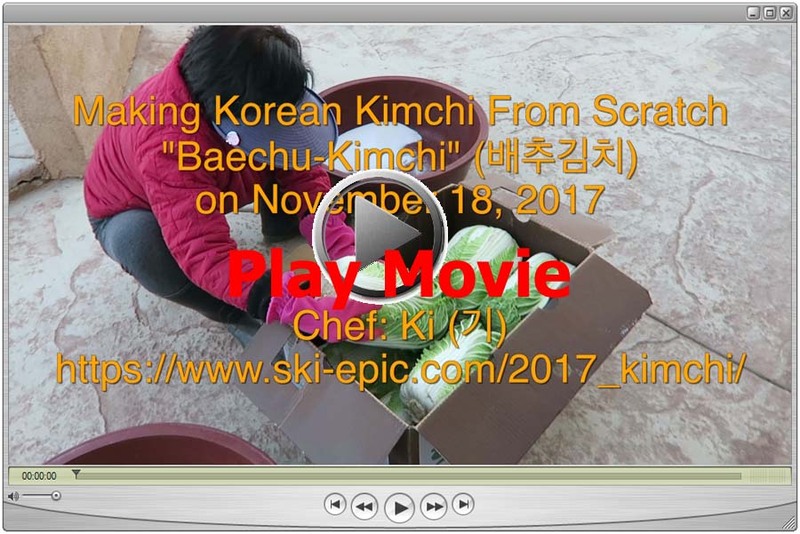 Here is a 30 minute long movie showing how Ki makes homemade kimchi with this recipe. Click here for the very highest quality 33 GByte original in QuickTime format.